The concept is simple, bring a Type 1, air cooled, VW, leave the Queen Mary in Long Beach, California and be the first one to the strip in Las Vegas, Nevada. We will be bringing you live updates on Jalopnik as the Beetleball road rally takes place. If you're familiar at all with Volkswagen Bugs you'll agree that just finishing the event would be quite an accomplishment. If our borrowed (stolen) Baja Bug can keep up with the rest of the teams we will continue the stream of updates. You're probably wondering how a race like this on public roads could be legit. 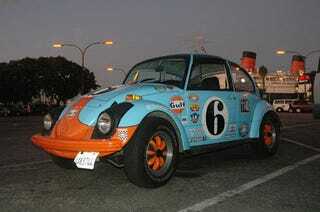 Remember were talking about Volkswagen Beetles here. The Beetle we have entered topped the dyno at a whopping 51 rear wheel horsepower. I'm not worried about a speeding ticket, I'm actually afraid we may get cited for impeding traffic. Before the cars can head out they must be inspected by Big Red who has experience with the Baja 1000. The tech was pretty stringent, "Is it a Volkswagen?" "Does it leak a lot of oil?" There are 33 classes to compete in with a mandatory checkpoint in Amboy, California, then a jog across the Hoover Dam and into the world famous Las Vegas Strip for the finish. So he wouldn't get lost, one seasoned Beetleballer wrote the route instructions on his arm. Quote of the day: "I'll see you in Amboy." "I'll see you in jail."